UK Apple customers will soon be able to stream catch-up episodes of their favorite BBC programs on the big screen, as the storied broadcaster announced plans to bring a version of its iPlayer service to the new Apple TV. The Beeb announced the news on iPlayer's official Twitter account on Thursday, saying an Apple TV iteration would become available "in the coming months." BBC News filled in some of the details an hour later. "Available on over 10,000 devices, BBC iPlayer is one of the biggest and best on-demand video services in the world, and has transformed how UK audiences watch programmes online," said BBC director-general Tony Hall. "I am delighted that iPlayer will be coming to the new Apple TV in the coming months, helping to bring the BBC's distinctive and loved content to an even wider audience." For those living outside the UK, BBC's iPlayer is a stalwart on-demand (colloquially referred to as catch-up), offline viewing and live streaming app that has long been a favorite source of content for locals, made popular in no small part thanks to the proliferation of iOS. While iPhone and iPad users had access to iPlayer for years, it was never offered as a channel option on older Apple TVs. Users would resort to streaming from an iOS device over AirPlay, which the BBC allowed. 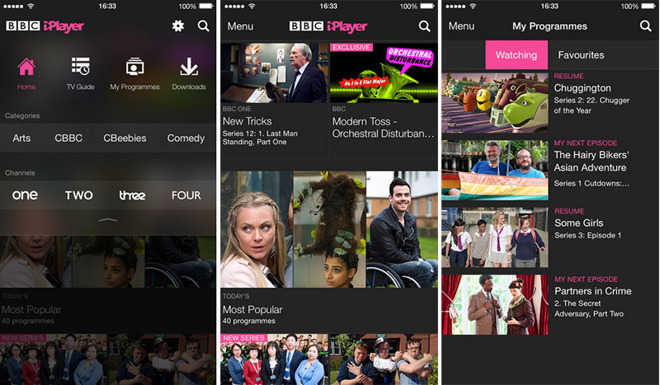 Although BBC did not specify exact hardware specifications, it appears iPlayer might be limited to fourth-generation Apple TV arriving in homes this week. The BBC News article mentions Siri universal search, a new Apple TV feature that aggregates search results from multiple sources, but does not confirm iPlayer compatibility at launch. Apple CEO Tim Cook earlier this month said third-party developers would soon be granted access to Siri's search API, but for now the list of supported apps is limited. For UK customers, upcoming BBC iPlayer access addresses a concern reviewers recently expressed regarding available content. Early reviews agree that Apple's slick hardware and software make it one of the best all-around packages available, but there is still room for growth, namely Siri search and a sparsely populated App Store. Those features are almost guaranteed to evolve, however, as developers are expected to flock to the platform.